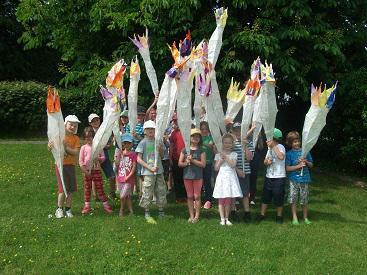 On Thursday 9th June the children had a wonderful time making willow Olympic Torches. Billy and Clare, from Marvellous Eventures, talked the children through the process step by step. Everybody had the opportunity to make the basic frame, add strengthening and begin to cover the frame with tissue paper. The children worked together helping and supporting each other as they each made their own creation. They will continue working on their Olympic Torches over the coming weeks and the finished pieces will be on display in school.